A show of hands please! When you hear ‘V’ word does it make you go Ooooh! Or Eeeew!? Well the good news is Angus offers great variety and no shortage of tasty vegan friendly treats to suit all tastes – and it’s not just for the herbivores! My name is Victoria and I’m a Vegan! I’ve been powered by plants for 2 years! I live in Kirriemuir, Angus, and I love that our beautiful county has such a variety of restaurants who now offer vegan options on their menus. The choice makes dining out with family and friends an enjoyable experience. It started as a bit of a joke actually, when my sister went vegetarian and I decided I would do one better – nothing quite like a bit of sibling rivalry! I didn’t think it would last, maybe a week would do it to make my point, but then a funny thing happened… I liked it! No actually I loved it! And it didn’t hurt at all! I felt better and a trip to the supermarket was much quicker when I wasn’t straying off-list with the temptation of, well everything! Less time in the supermarket picking stuff someone else made for me, and more time in the kitchen having fun trying out new recipes with new ingredients I had never heard of! I won’t lie, my first attempt cooking tofu was a major fail, and when I presented soggy sponge curry to my family they weren’t convinced! But smiled and ate it anyway. 2 years on my husband has joined the V-Gang with me, turns out he likes it too! And my 7 year old daughter will happily scoff my vegan offerings – as long as she can still get fish fingers at Grannies! I love that she is interested in veganism and she asks lots of great questions, perhaps one day she will cook tofu better than me! For the meantime however she is happy to help us out by eating our ‘garden eggs’ laid with love by our 6 beautiful rescue hens who will share in exchange for hugs! Gone are the days when you need to worry about being the only vegan at the table! There are so many fantastic café’s, restaurants and pubs offering diversified menus that cater for all tastes and dietary requirements. So you can catch up with your steak loving pals over lunch safe in the knowledge that you can look forward to a tasty vegan offering that might even make your meaty mates go oooh! Fancy a big juicy Burger loaded with oozy rich Chilli? Or creamy Tikka Masala with fluffy rice and crispy poppadums? Look no further than Dunnichen Stone in Forfar, who have a dedicated vegan menu that will knock your socks off! Sharkys Bar in Montrose also offer a dedicated vegan friendly menu with classics such as Vegan Mac & Cheese, Battered Haggis Balls, Vegetable Pakora, Brownie Sundae! My personal favourite is the Haggis – Burns night 25th January people! Armstrongs and The Drovers Inn, both just outside of Kirriemuir, are our firm favourites for a special occasion. On the face of it their menus are pretty meaty! However if you contact them in advance their chef will create the most wonderful bespoke vegan menu for your visit, usually with 3 options each for a starter, main and dessert – the only challenge is to decide what you want as they are always so thoughtfully planned and delicious! Roo’s Leap Restaurant in Montrose already has a great reputation… fresh ingredients cooked to order, and a friendly efficient service with a laid back Aussie attitude AND they offer a dedicated vegan menu which has something for everyone! Always worth a visit if you are in the area and a lovely place to go for either a laid back meal or a special occasion. Ever wondered what Cactus tastes like? 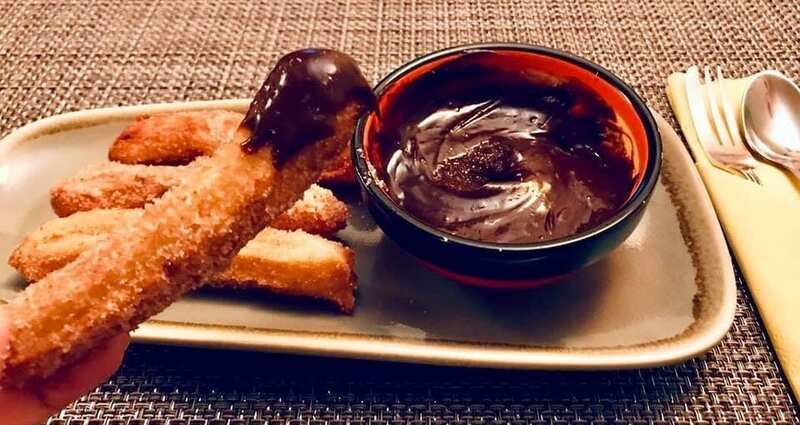 Try something a little bit different at El Tajin in Montrose, where you will be treated to a warm welcome and a fantastically unique Mexican style menu – Mexican chocolate Churros dessert? Yes please! Andreous Bistro in Arbroath offers Authentic homemade Greek/Mediterranean food in a comfortable and relaxing atmosphere. Their vegan options are full of flavour and definitely require a repeat visit! Specials include Puy Lentil & Candy Beetroot Burger, Homemade Harissa Falafel Burger with Spiced Roasted Red Peppers, and Mediterranean Vegan Burrito. 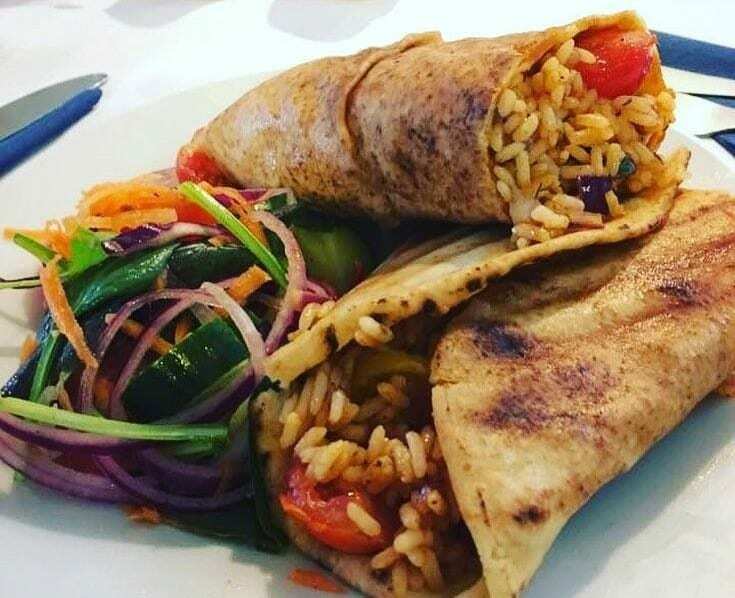 Blu Bar in Carnoustie offers a delicious selection of Mediterranean food, daytime and evening, in beautiful surroundings with a great selection of starters, Meze platters and mains – just feels like you’re on holiday! We are spoiled for choice in Angus with fantastic coffee shops where we can grab a coffee and a light bite. Wild Thyme Café in Arbroath offers Sweet and savoury Vegan options daily, with specials such as Baked potato with white bean, coconut and butternut squash stew and Raw Pad Thai Salad with Peanut Dressing, you are guaranteed something super tasty! 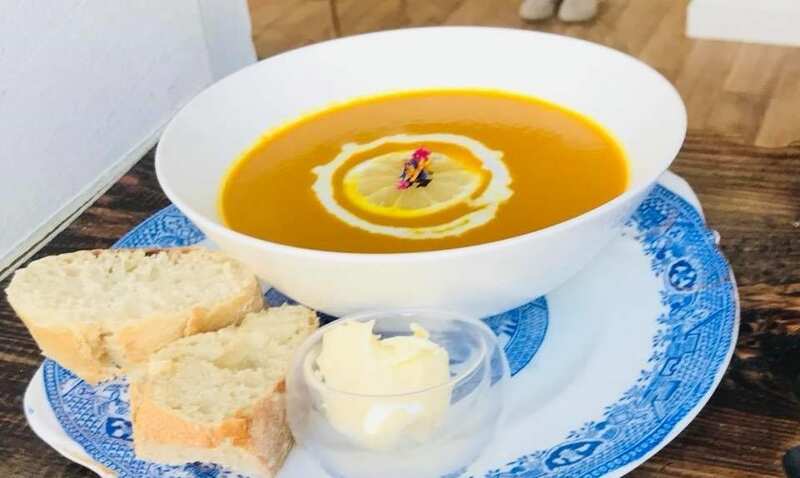 Gather in Carnoustie is a fabulous farm shop and café offering vegan Soups, Cake, freshly made seasonal food and amazing coffee localy sourced from Arbroath based Sacred Grounds – and they are dog friendly so you can take your furry friend to lunch too! Be organised and communicate in advance! The thought of dropping the ‘V bomb’ on a poor unsuspecting waiter when I’m ordering my food gives me the absolute fear! There is nothing worse for the customer or the poor server when there is an awkward silence as the tumbleweed rolls across the table! Be patient and don’t assume that everyone knows the in’s and out’s of plant based eating – your experience will be much more positive if you approach it with this level of understanding and diplomacy. To avoid awkward situations you can check menus online in advance or if you are unsure contact the venue in to enquire about vegan options. The majority of places will be happy to highlight vegan friendly items on their menu, or offer vegan friendly specials on the day of your visit which they can plan with some notice. I have been met with some very enthusiastic chefs who have personally contacted me following an enquiry to their venue, and they have been excited at the challenge of coming up with a vegan friendly option – something a bit different for us both! Each time we spend money on a product or service, we are supporting that ‘thing’. If we want to see more sustainable production, we need to be more sustainable consumers and ‘vote’ with our money. Every time we shop or order food in a restaurant – every time we eat – we can choose to make real consumer shift. 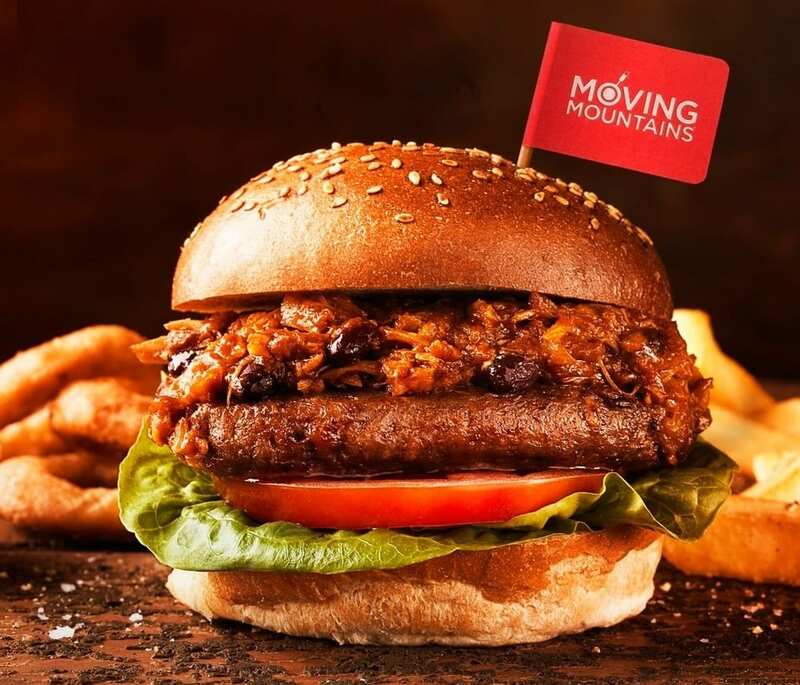 Every time we make the switch from an animal product to a vegan one we making a difference to consumer trends and it doesn’t take long for businesses to catch up and go where the money is – meaning lots more vegan goodies coming our way! Whether you decide to dabble or go full herbivore, going vegan is easier than ever before, becoming increasingly mainstream as more and more people from all walks of life discover the benefits. So the next time you see the ‘V’ on a menu why not give it a try? – you might just love it and I promise it won’t bite! Time for you to visit the restaurants and cafes in Angus, sample their vegan menu options and share your experience on facebook.